Want to improve your market timing so you can send your investment returns soaring? Market Timing For Dummies takes the guesswork out of developing a trading strategy and provides all of the tools you need to forecast, prepare for, and take advantage of market trends and changes. Yes! You can make money in any market, whether trends are rising, falling, or moving sideways. 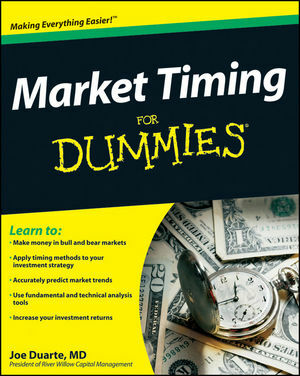 Let Market Timing For Dummies show you how. Joe Duarte, MD, (www.joe-duarte.com), is a leading independent analyst focusing on intelligence, energy, and geopolitics and their effect on the financial markets. One of CNBC's original "Market Mavens," Dr. Duarte has been writing about the financial markets since 1990. Part I: Stepping into the World of Market Timing. Chapter 1: Becoming a Market Timer. Chapter 2: Peering Inside the Mind of a Market Timer. Chapter 3: Preparing Yourself and Your Finances for Timing. Chapter 4: Charting Your Course: The Market Timer’s Edge. Part II: Market Timing’s Methods and Strategies. Chapter 5: Timing with the Reports That Move the Markets. Chapter 6: The Seasons and Cycles That Infl uence the Markets. Chapter 7: Digging In to Trends, Momentum, and Results. Chapter 8: Timing with Feeling: Making Market Sentiment Work for You. Part III: Applying Timing to the Markets. Chapter 9: Timing in the Real World: Examining a Sample Trade. Chapter 10: Timing the Stock Market. Chapter 11: Timing the Bond Market. Chapter 12: Timing Foreign Markets. Chapter 13: Timing the Metals, Heavy or Not. Chapter 14: Timing Commodities: Making Money Down on the Farm. Chapter 15: Timing Currencies and Related Markets. Part IV: Timing the Sectors. Chapter 16: The Timer’s Dream: Sector Investing. Chapter 17: Timing Financial Service Stocks. Chapter 18: Timing the Technologies. Chapter 19: Timing the Energy Sector. Chapter 20: Timing the Health Care Sector. Chapter 21: Ten Game Savers to Know and Trust. Chapter 22: Ten-Plus Awesome Resources.